Sardines, you can love them or hate them. I have transitioned from the latter to the former over the years. I totally disliked them during my childhood because of their innumerable bones that had the highest likelihood of getting stuck in one’s throat. However, my tastebuds got transformed drastically during my second pregnancy and I love sardines ever since. They say that mums to be experience nausea when they eat or even smell or see certain foods as the baby apparently will grow up to dislike those foods. Not sure how far you believe it but this saying has come true in my case. While I couldn’t even stand the aroma of fish when I was expecting my son, I totally loved it during my daughter’s time. This probably explains why my son detests fish and my daughter adores it, with the exception of sardines of course because of their perilous nature. Thanks to our common love for this fish, I now buy it more often but generally resort to frying it. 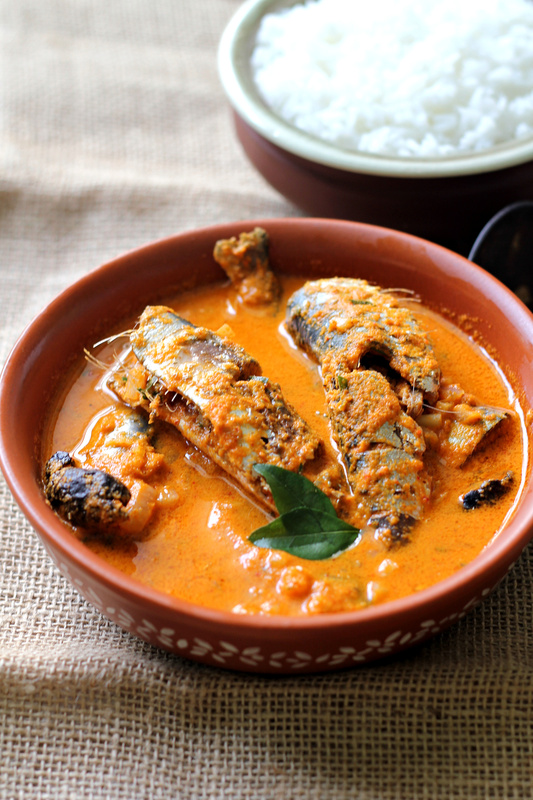 There is no meal more satisfying than fried fish, rice and dal and perhaps a simple vegetable on the side. When I first tried this recipe I never thought I’d love it so much that I’d want to eat this curry repeatedly. When it comes to sardines, I always prefer them fried because that way I can fry them to a crisp and enjoy them without worrying too much. However, when I tried this recipe, hubs and I were bowled over. The recipe was simple and easy and took little time to put together. 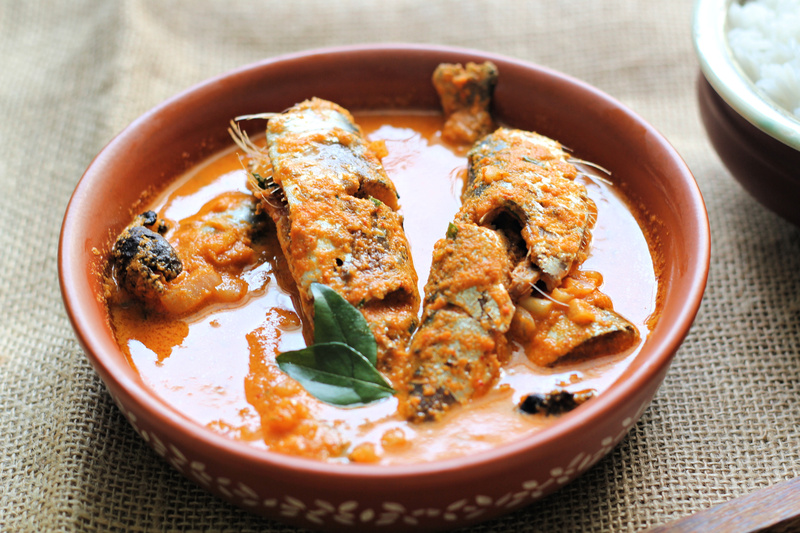 After that day I bought sardines several times with the intention of shooting pictures for the blog but never managed to because fish curry is best eaten when fresh and hot. Shooting pictures usually takes a while and nobody wants to wait that long! 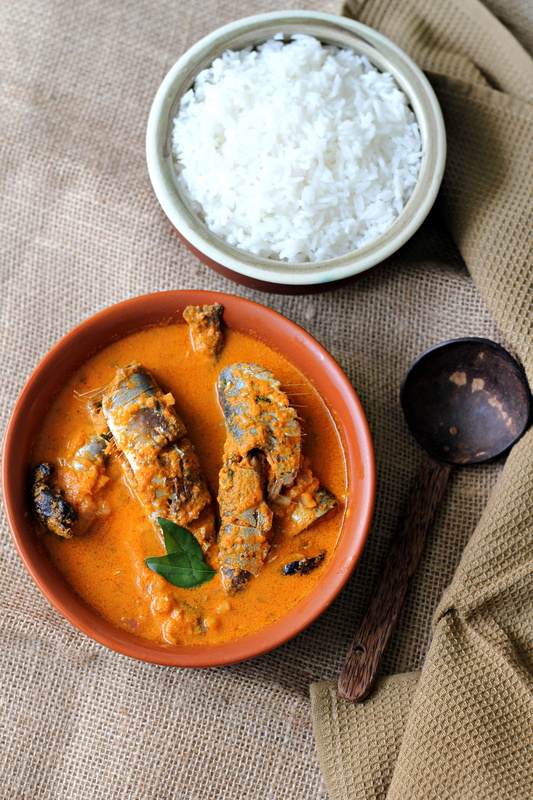 I am also quite hesitant about shooting fish curries, especially sardines because the fish is so delicate that getting it out of the pan and into the serving plate and rearranging it to look visually appealing is tricky. While I was trying to manoeuvre the fish on the right it broke! I really didn’t have the time to re-shoot as I had to run to school to pick the kids. Nevertheless I am glad that I got reasonably decent shots because I simply couldn’t keep this recipe from you guys any longer! If I were to describe this curry to you, well, I never really use kokum in my cooking but the recipe called for it. The tang that kokum lends is quite unlike any other souring agent. It does not lend any sweetness to the dish like tomatoes tend to do and neither does it darken or thicken the gravy like tamarind does. Kokum is beautiful and unassuming, it just gives its flavour without disintegrating. I must use it more in my cooking and put that big bag of dried kokum skins to good use. Do give this recipe a try and I seriously hope you enjoy it as much as we do. 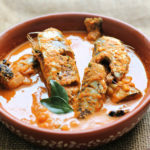 If you love sardines, scroll down for some more recipe suggestions! 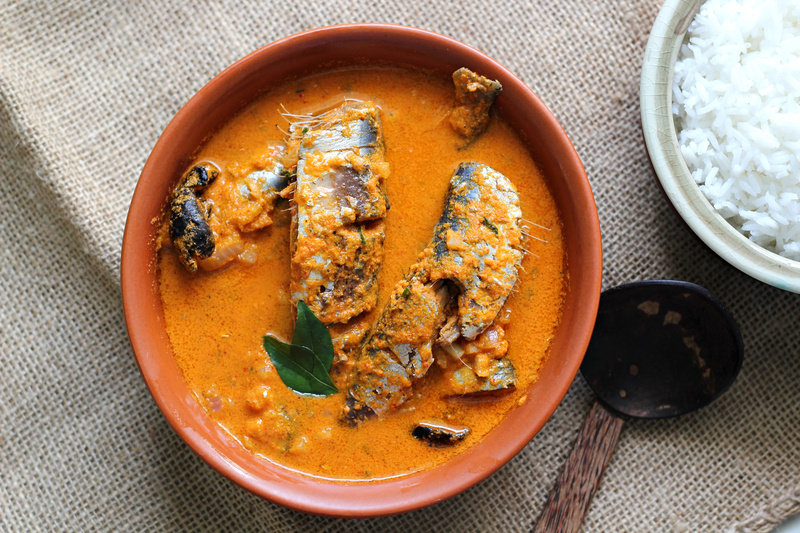 An easy and quick sardine curry that calls for a few basic ingredients. Tastes wonderful with piping hot boiled rice! Layer a heavy based pan/kadai or an earthen vessel with one part of the masala. Place 4 sardines over it. Place another layer of the masala and top it with a few more sardines. The final layer will have the last portion of the masala and the last few sardines. Pour the reserved masala water over it and add a little more depending on how much gravy you need. Don't add too much or it will be diluted. Add salt to taste and bring the curry to a boil. Cover and cook for approx 2 minutes. Remember not to overcook it as the fish is added before the curry begins to boil. Overcooking will disintegrate the flesh & you will have too many bones to deal with. Reduce the heat to a simmer, pour the coconut oil and sprinkle the powdered methi seeds over it. Cook for half a minute (or an extra minute if the sardines are big). Remove from heat and let the pan remain uncovered for half a minute.